Before installing Mendeley, you will need to visit the Mendeley homepage and create an account by answering a few questions about yourself and your area of study. Once your account is created, you will be redirected to the download page. Follow the instructions there to install and set up Mendeley, and be sure to check out the features overview for help getting started. The Mendeley web importer makes it easy to add items to your library directly from the web. It is compatible with all browers and a wide variety of websites and databases. Click this link and follow the instructions to add it to your browser. The Mendeley iOS app allows you to access your library from your iPhone or iPad. Click here to find it in iTunes. One of the most useful things to do after installing Mendeley is to set up one or more watch folders. 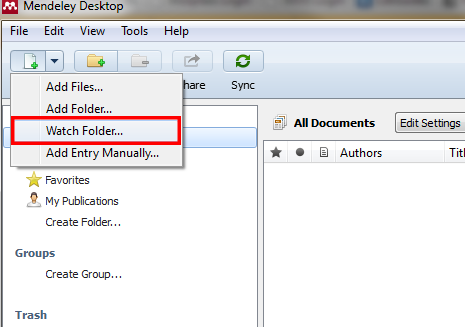 Mendeley will monitor these folders for new PDFs and automatically update your library when it detects changes. You might also want to explore Mendeley's social features to find papers, people, and research interest groups that you are interested in. These features are available on the Mendeley website after you log in. 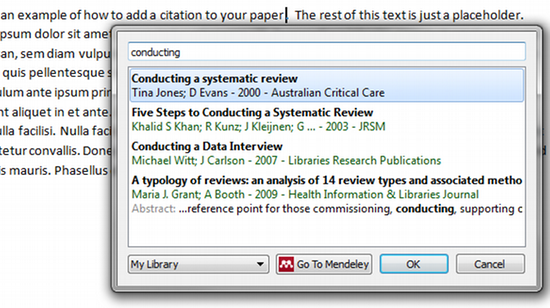 Mendeley comes with several citation formats built in, including APA, MLA, and Chicago. By default, you will be able to generate citations and manage bibliographies using these built-in formats. 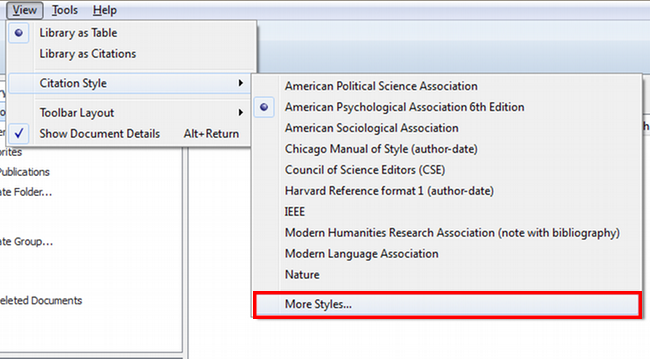 If you want to use a different format, you will need to add it to Mendeley. To search for available styles, and to select your default style, use the "View" menu. Adding a new style is as simple as searching under the "Get More Styles" tab, finding what you want, and clicking "Install." 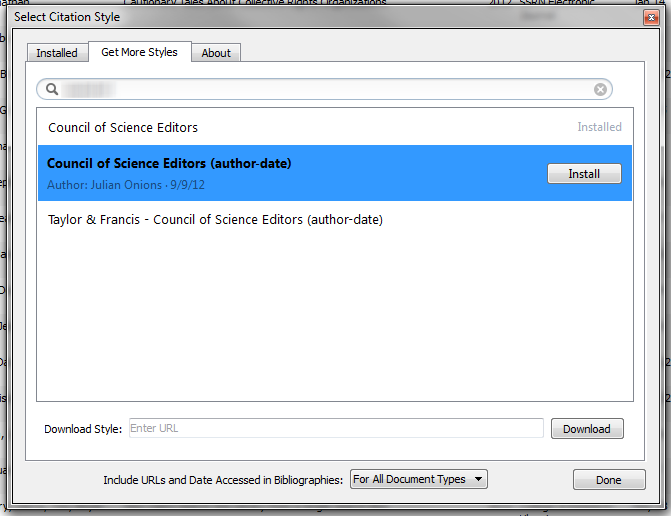 Important Note: In order for Zotero to create the appropriate citations for your seminar paper, install and use the "Council of Science Editors (author-date)" style. This matches the NLM author-date format. The NLM formats available in the Zotero style repository use the citation-sequence variant of NLM, which is not recommended. 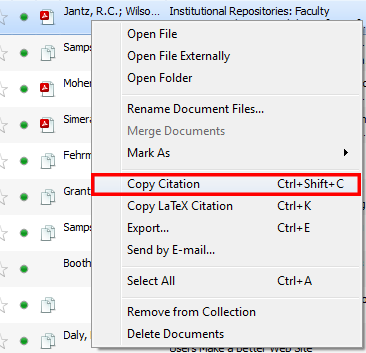 To copy the reference for an item in your library to the clipboard, right-click (ctrl+click for some Macs) on the item and select "Copy Citation." You can also use ctrl+shift+c as a shortcut. The citation will be generated using your default format and copied to the clipboard. You can then paste the reference into the program of your choice. 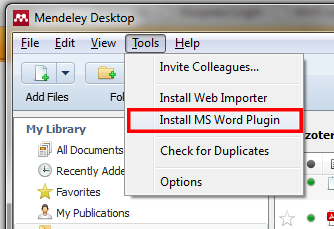 This is as simple as selecting "Install [your word processor] Plugin" from Mendeley's "Tools" menu. the body of your paper. Mendeley will automatically keep track of which sources you've cited and generate a bibliography for them. The following examples were created in MS Word. 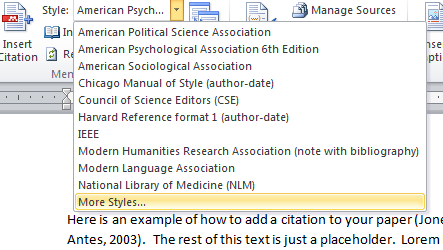 Step 2: Add your citations using Mendeley Cite-O-Matic Mendeley's citation tools are located under the "References" tab in Word. To add a citation, move the cursor to the appropriate place in the text of your document and click the "insert citation" button on the Mendeley toolbar (see above). A search box will appear. You can search your library for the title, author, or abstract (if available) of the article you want to cite and select it. You may select as many articles as you need to cite. Click OK to add the properly formatted reference to your paper. You can change the format using the "Style:" dropdown. bibliography to begin, then click the "Insert Bibliography" button (see above). If you have a good eye for APA style, you might have noticed that the example bibliography above contains a common error. Although reference managers and other citation management tools are useful ways to track and cite sources, they are not perfect. As a standard precaution, you should always double-check any material that is auto-generated by a software tool. 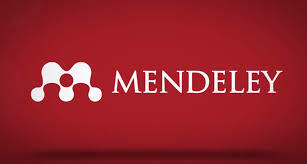 If you lose points on a paper due to improper citation, blaming Mendeley is unlikely to help you get them back. Remember: if you need help with citing, you can contact the library for help!